It seems like just yesterday that the world was welcoming the birth of the third in line to the throne. When Prince George was born, the world became interested in the royal family in a way they hadn't been since Prince William and Kate Middleton got engaged and then married. Prince George breathed new life back into the monarchy that his priceless faces (and Queen Elizabeth's love of Game of Thrones) is keeping alive and well to this day. Now that Prince George is turning 1 years old, it's about time that we all start treating him like the respectable future ruler that he is going to be. To be fair, the world is already looking to Prince George for his influential opinions on things like walking, other children, and being out in public. Prince George seems to have an unimpressed look ready for every occasion that is sure to keep all of the peasants talking. However, an important part of being a royal, at least in fantasy novels, is making royal decrees for the peasants to follow to the letter of the law. The British Royal Family might not have quite enough influence to turn just any royal decree into finite law, but Prince George is still cute enough that those cheeks could get us all to sit up and listen. Based on his life so far, what are some decrees we'd expect the Future King George to bestow about his followers? 1. His Royal Highness' Birthday shall henceforth be considered an international holiday. Between his small birthday party, wealth of toys, and massive press coverage, Prince George's birthday might as well already be considered an international holiday. But why not make it official so we can all get off from work? 2. Play dates with peasants shall be conducted on an annual basis until the age of five. Listen, I'm sure that Prince George loves making nice with other children, but it wouldn't do to have any of them forget that he is their ruler by blessing them with his presence far too often. Besides, making the play dates an annual thing would reduce the likelihood of Prince George stealing other children's toys. 3. All pictures of His Royal Highness walking are to be heralded with great press. We're doing well enough on that front so far, but surely His Royal Highness wants each and every single picture of himself walking to make the front page of every publication. With these tiny feet, he shall mould the world. We peasants better recognize. 4. Royal Tours must now involve royal nap time. The cranky expression on Prince George's face during his first royal tour was either a result of too much nap time or not enough nap time, but either way he'd like nap time to be incorporated into his overseas schedules. Surely he can't be expected to do a photo op with bags under his little eyes! 5. Butterflies are henceforth to be considered England's national animal. The official portraits of Prince George that were released for his birthday featured the young prince with his parents, touching butterflies and being better than you. 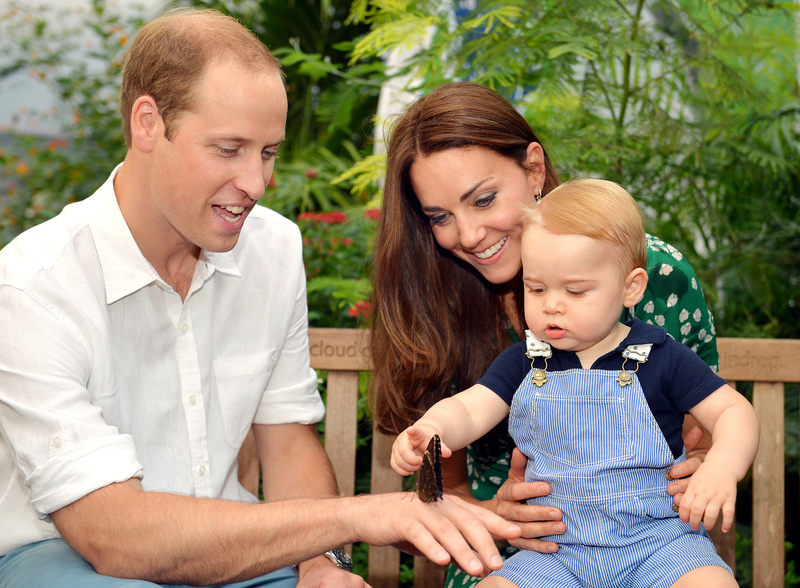 Sorry, Lupo, but it looks like butterflies are going to be featuring on Prince George's official crest. 6. His Royal Highness is the future king and can do whatever he wants whenever he wants. Are you the future king of England? Are you? No? Then you don't get to tell Prince George what to do. Admittedly, Prince George doesn't seem to like taking orders from Kate Middleton, the future queen, or Prince William, the first future king, either, but, hey, he had a Wikipedia page before he was born. They should answer to him. 7. His Royal Highness reserves the right to be completely unimpressed by you. This right can never be revoked from Prince George because his face is never going to stop being unimpressed whenever he has to look at you. Just get used to it. 8. His Royal Highness must never be overshadowed by his mother's hats. What are you looking at in this picture? Is it the royal baby or the royal hat? If you answered the royal hat, then you are breaking the law because Prince George henceforth decrees that Kate Middleton's hats are no longer allowed to pull focus in his photo ops. The future king has spoken and so it shall be.